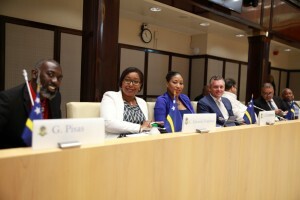 WILLEMSTAD – Recently during a press conference, the leader of the opposition party MFK, Gerrit Schotte, indicated that they have a report from a Belgium group that was here on the island to investigate the development of the construction of the new hospital (HNO). The former Prime Minister reminded everyone about the marathon meeting in 2013 where Prime Minister Daniel Hodge received instruction from the then coalition to change the location of the new hospital from the Zeelandia area (former Amstel brewery) to Otrabanda. “Since 2013 several governments have made certain decisions that have caused an increase in construction costs. We are now 64.2 million guilders more than originally 450 million guilders that were budgeted for the new hospital,” said the MFK leader. The main reason for this increase in construction costs is a complex organizational structure which has several contracts and agreements between various stakeholders. Schotte also stressed that the lack of decision was also the cause of all these problems with the new hospital.